Washington, D.C., the United States capital, and New York City are two of the most popular travel destinations in the United States. These cities are often paired on itineraries of the eastern U.S. because they are, at most, only about five hours apart. 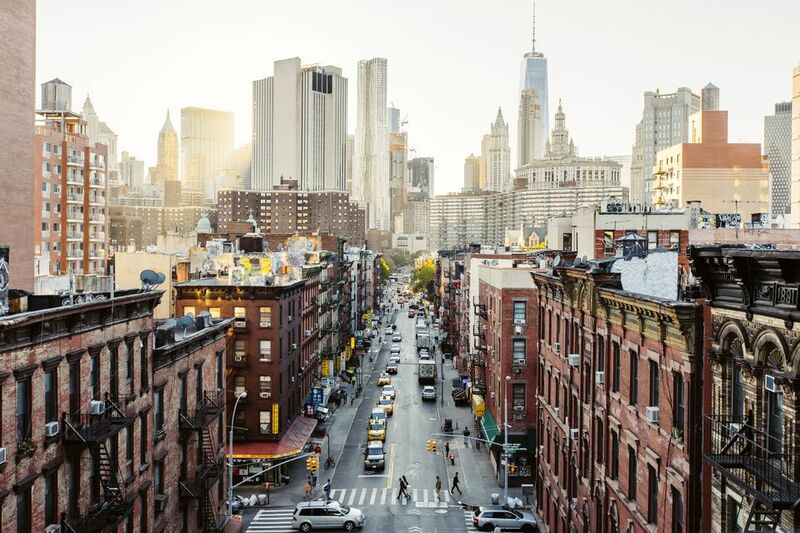 Because the route between ​Washington, DC and New York City (NYC) is so well-traveled, there are several transportation options for getting from one place to the other. Travelers can select from the most common options. Driving from New York City to Washington, D.C. takes approximately four to six hours depending on how many stops you make. This option is ideal for families and those who wish to stop for a meal or a bit of sightseeing. Driving time from Washington, D.C. to New York City is affected by the time you leave. Rush hour traffic in either city tends to be heaviest from 8 a.m. to 10 a.m., and from 4 p.m. to 7 p.m. The preferred route of most drivers is I-95 from Washington, D.C. through Maryland and Delaware, and then the New Jersey Turnpike through New Jersey, taking one of the exits between exits 10 through 14; and then entering New York City via a bridge or tunnel. There are a number of tolls along the way between the District and NYC, including the Fort McHenry Tunnel in Baltimore; the Delaware Memorial Bridge between Delaware and New Jersey; the New Jersey Turnpike; and the bridges to New York City, such as the Goethals and the Verrazano. Expect to pay approximately $37 for tolls one way. You can pay for tolls with cash. Drivers who do this drive often have an E-Z Pass, which allows for quicker travel through toll plazas. If you have an E-Z Pass from another area you can use that and they will bill you. Travel by bus takes approximately five to six hours, a little more than driving yourself. This option is ideal for budget-minded travelers and students who may not have a car. Taking the bus is the same as going by car except that someone else is doing the driving and you don't have the expenses of toll and fuel. Taking the bus has long been among the cheapest options for travel between Washington, D.C, and NYC. One-way tickets may cost as little as $14, and usually, don't cost much more than $30. Greyhound Buses, which operate out of the Greyhound Terminal near Washington's Union Station and the Port Authority in New York City, used to be the only game in town. But now there are other companies competing for travelers' dollars. They include Bolt Bus, Megabus, and a fleet of inexpensive buses that operate between the two cities' Chinatowns. Most all bus lines offer onboard entertainment and Wi-Fi. Train travel between Washington, D.C. and NYC takes a little over three hours and is an ideal option for business travelers and others who want to get there quickly. Train travel onboard Amtrak is usually reliable, fast, clean, and spacious. Best of all, taking the train is the fastest way to get from city center to city center without all the hassle of rest stops or security checks as you might experience while traveling by bus or plane. In fact, you may be able to shave off 90 minutes of travel time compared to taking the bus. The endpoint stations for train travel between Washington and New York are Union Station, in Washington D.C., and Penn Station in New York. Travelers taking Amtrak can also take a regional train, which makes frequent stops at stations along the way, or the Acela, an express train—it might mean the difference between nearly four hours of travel time and only two hours and 51 minutes. Regional trains tend to cost less, but this is not a hard and fast rule. Both types of train service have cafe cars and quiet cars (cell-phone free), ideal amenities for harried business travelers between these two cities. As for rates, trains are never as cheap as buses and are sometimes as expensive as plane flights. For example, an Amtrak "saver" ticket might cost $69 while a "premium" (business class) ticket might run you as much as $400. By the time you wait in line for security and check in early, flying from the two cities may take two to three hours. With an actual flight time of an hour and 20 minutes, flying is still the best option for those who want to travel quickly. Most flights from Washington, D.C. to NYC originate and terminate at those cities' domestic airports: Washington National Airport (DCA) and LaGuardia Airport (LGA). But travelers on the lookout for deals will do well to check fare pairings on travel search engines between Dulles Airport (in DC's Virginia suburbs) and Newark Liberty in nearby New Jersey or John F.
Kennedy airport in Queens, New York.